A detox diet can feel restrictive, but it’s important that you enjoy your meals if you are to gain maximum benefits from your plan. It can be difficult to work out what’s on and off the menu during a detox, but if you’re willing to try new foods and new ways of preparing them, you might find you’re still eating them long after your detox is done. During your detox you might assume you’ll be living on fruit and vegetables alone. While many a hardened detox fan enjoys such a regime, for many, the thought of it is enough to have us running for the nearest chocolate bar. Adding rice and other whole grains, like quinoa and millet, to your menu will add fibre, taste and texture, and will also ensure you stay full up until breakfast time. Though meat and poultry may be off the menu, fish is permitted in many detox diets. Brimming with protein, fish will help to keep you satisfied, and oily varieties will top up your omega levels. Try grilling a piece of tuna and serving with steamed vegetables, or simply add tinned oily fish to a baked potato and salad. Just remember to opt for organic produce where you can. 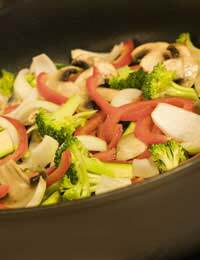 A great meal idea for when you don’t have much preparation time is a stir fry. Bursting with nutrients, stir fried vegetables served with prawns and a whole grain of your choice will make a power-packed supper. If you miss salt or readymade stir fry sauces, try a little ginger or garlic to add toxin-free taste. Soup is such an easy detox meal idea, and a homemade version will have infinitely more taste and goodness than shop bought varieties. Simply choose your favourite root vegetables and add herbs and garlic, and make enough soup to freeze in batches for convenience. Warming and packed with vitamins and minerals, you’ll be giving your natural detox processes a real boost. When the weather is warm outside, there’s nothing like a colourful, crisp summer salad to eat al fresco. During your detox, try some different ingredients to add excitement and new tastes to your salad, and make it visually appealing by adding foods of varying colours. Raw vegetables are full of enzymes, and will be digested and used by your body quickly. Casseroles are a great winter warmer, and like soup, they can be frozen for ease. Making a casserole with a variety of beans and vegetables is simple and very wholesome. Fibre-packed beans will promote good digestion and help to clear and cleanse your system. Who said a detox diet had to be boring? Use it as an opportunity to feed your body and mind with some tasty new foods, and enjoy preparing your meals every day. Try to make your detox the catalyst for a lifestyle change, rather than simply a quick fix. This way you’ll be helping to cleanse your body from the inside out every day.